Fresh popcorn seasoned with savory salt and buttery flavor. Fresh popcorn covered with powdered cheddar cheese. Fresh popcorn covered with white powdered cheddar cheese. 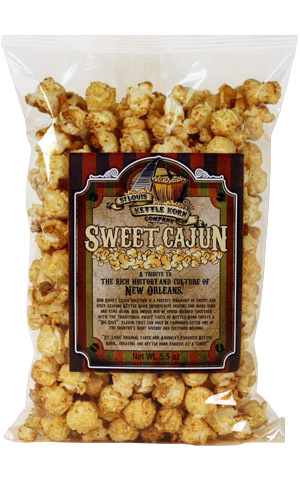 Fresh gourmet popcorn coated with the richest, creamiest cheddar cheese flavor available. 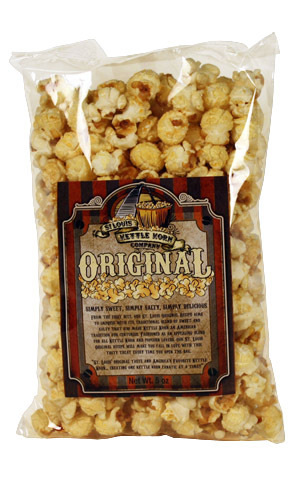 Lightly sweet with a little salt... classic kettle popcorn! Gourmet Butter, Caramel and Cheese Flavored popcorns mixed together for a deliciously unique popcorn taste. Candied popcorn with the bold, rich flavor of caramel. Candied popcorn with a rich, buttery crunch. Candied popcorn with a rich, crunchy coating of butter and cinnamon. Delicious gourmet popcorn, premium roasted almonds and pecans, all generously coated with a rich butter toffee. Delicious gourmet popcorn, loaded with pecans, all coated with a rich buttery caramel flavor, then drizzled in rich, semi-sweet chocolate. Delicious gourmet caramel popcorn loaded, with roasted & salted almonds, and drizzled with rich semi-sweet chocolate. 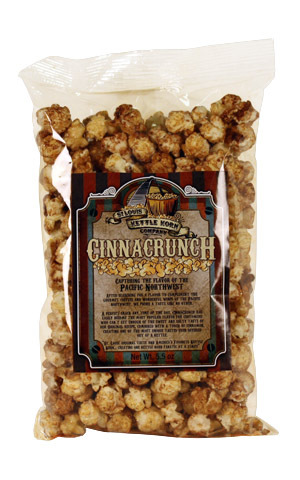 Fresh gourmet popcorn, blended with a rich butter flavor and drizzled with creamy milk chocolate. Gourmet caramel popcorn loaded with tangy cherries, smothered in an avalanche of creamy white chocolate. Our old fashioned caramel popcorn balls. Available Sep 1 thru Oct 31 only. Old fashioned popcorn balls with a rich butter toffee flavor. Old fashioned caramel popcorn balls drizzled in chocolate. A fortune cookie dipped in your choice of white, milk, or dark chocolate. A salty pretzel rod generously dipped in caramel, rolled in pecans, dipped in rich milk chocolate, and drizzled with dark chocolate. A salty pretzel rod generously dipped in a rich coating of your choice of white, milk, or dark chocolate, then rolled in festive sprinkles or confetti. Rich, smooth milk chocolate bar with the word “St. Louis” extended through the arch. 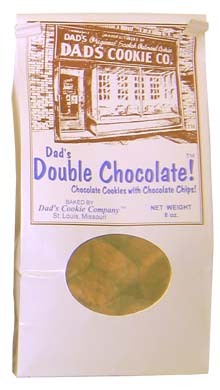 Delicious milk chocolate shaped like the arch with the St. Louis skyline beneath. Rich milk chocolate embossed with the words “Thank You”, packaged in a White, Red or Gold Box with slots for a business card on the back. Potato chips layered in smooth caramel, pecans, and potato stix, then coated in creamy white chocolate and dark sprinkles. Strawberry licorice dipped in milk chocolate. Marshmallow Lolli dipped in milk chocolate. Sweeten your coffee with five flavors of chocolate... Hazelnut or Irish Cream in milk chocolate, Kahlua or Cappuccino in white chocolate, or Amaretto in dark chocolate. Heart shaped lolli available in milk, white, red, or pink chocolate. A clear cello bag of chocolate hearts available in milk, white, red, &/or pink chocolate. A three-dimensional RED or WHITE chocolate rose bud (also available in milk chocolate) on a green plastic stem with leaves. The bud is enclosed in a clear cello cover and tied with a ribbon. 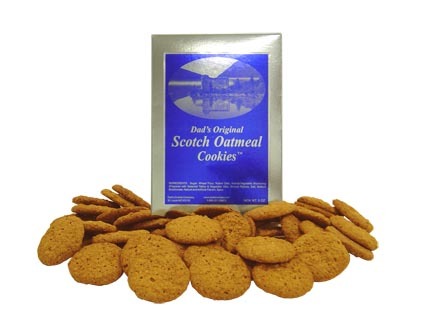 The same great oatmeal cookie that Dad’s is famous for… baked smaller but big with the taste! 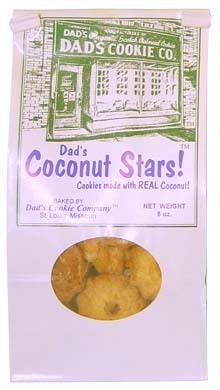 If you like coconut cookies, then these are the “star” of the show! A chocolate cookie with chocolate chips... a chocolate lovers dream! A crispy, crunchy, oatmeal cookie studded with wholesome rolled oats. A crispy, crunchy cookie studded with wholesome rolled oats. The Original! 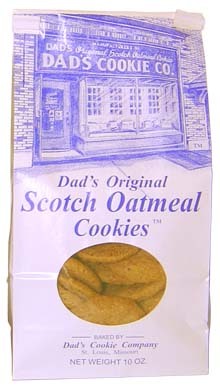 Dad’s Original Scotch Oatmeal™ Cookies two-thirds dipped in rich milk chocolate and scrolled with a dark chocolate “S”. Fashioned as an appealing blend for all Kettle Korn and popcorn lovers, our St. Louis Original® recipe will make you fall in love with this tasty treat. Sweet and salty combine with cinnamon creating one of the most unique tastes to ever be offered out of a kettle. Sweet and spicy come together, leaving Kettle Korn enthusiasts begging for more time and time again. 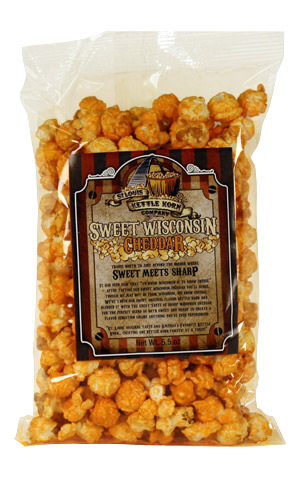 We've taken our original flavor Kettle Korn and blended it with the great taste of sweet Wisconsin cheddar creating a flavor sensation unlike anything you've ever experienced. 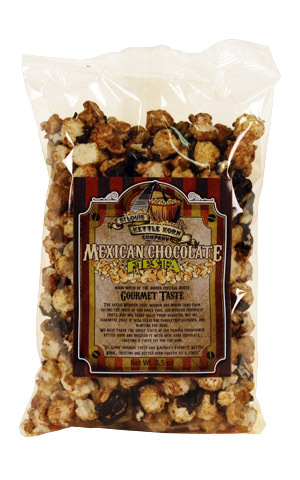 We have taken the great taste of our famous CinnaCrunch® Kettle Korn and drizzled it with rich, dark chocolate.